We are a bit short on storage space in our home, so I don't have too many Christmas decorations any more. So I make some of my day to day decorations perform double duty. I have two of these on my dining room table that are usually filled with green apples, but for Christmas they are filled with decorative balls and trinkets - some vintage, some new. It's a fun solution to a common problem. 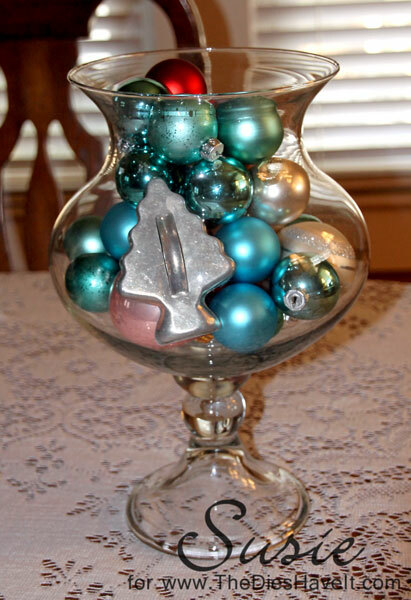 Do you use your everyday items in your Christmas decorating? I always wonder what others do!! See you tomorrow with a fun gift tag for you.